The term "podcast" comes from the combination of two words: "iPod" and "broadcast". In its most basic form a podcast is an audio file that is published by its creator to a website so that it can be downloaded and listened to offline by the site's users. Often the podcasts are in audio formats like MP3 that can be downloaded from computers onto portable music players like the iPod so that they can be listened to anywhere. Enhanced podcasts can also contain still images or video content leading to the term, vodcasting or "video podcasting". Teachers are beginning to use podcasts to deliver class lectures, class events, class research projects, and basic class news. Involved teachers report that student engagement is high while working with this emerging technology. What software do I need for Podcasts? The type of software that you need will depend upon what you intend to do with the podcast. For Subscribing to/Downloading Podcasts - Most of the Internet browser (or web-browser) software will let you click on a link to download the podcast file which then can be listened to in your "player" software. 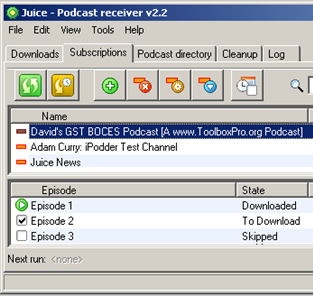 ToolboxPro Podcasts are set up so that they can be subscribed to with iTunes or other aggregator software. For Recording/Creating a Podcast - There are many programs that will let you record audio to your computer. A quick search at a site like Google will reveal many programs that you can download and install. Some of these programs are free, some are available at a low or minimal cost, and some are full-fledged digital recording studios costing $500 or more. Which program should you chose? That will depend on what features you would like the software to have. You might want to choose one that will let you do some simple editing so that you can removed dead air, sound glitches, or mistakes. You also want to add background music or a theme song to accompany your podcast. One program worth mentioning is Audacity which is available at http://audacity.sourceforge.net/. It is a totally free, open source program which you	can download and install on your computer to record and edit audio at no cost to you. You will also need some kind of microphone to get the audio signal into the computer. Low cost microphones and headsets are available online and at many electronics stores. To subscribe to a Podcast, you will need to know the address, or URL, of the podcast feed. There are many sites on the Internet that have been set up a Podcast Directories (http://www.podcast.net/, http://www.podcastalley.com/, http://www.podcastpickle.com/, etc.). ToolboxPro has its own podcast directory at http://v2.toolboxpro.org/podcasts/. In ToolboxPro the podcast URL is listed on the Edit A Podcast page. 1. Click the Add new feed button. 1. Choose Subscribe to Podcast... from the Advanced menu. 2. Enter the URL of the Podcast's feed, and click OK.
3. 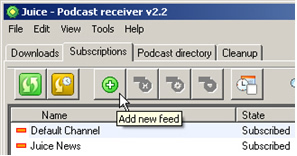 Click the Check/Download selected feed button to retrieve the podcast episode. 3. The podcast will appear in the Podcast listing. You can download individual episodes by clicking the Get button. Where can I learn more about Podcasting? The sites below offer lots of links to many aspects of Podcasting.